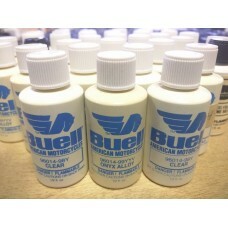 1/2 fl oz of Buell OEM touch up paints and clears. Most of these are singles. Some may require bases and top coats and I may or may not have them. What I have here is all I have in stock. I am checking each one before the ship but so far everyone I've checked looks good and is liquid. $7.50 flat rate shipping regardless of quantity. If you are unsure of your color you can view a few color and paint docs here.